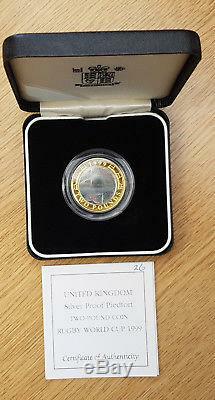 United Kingdom Silver Proof Piedfort Rugby World Cup 1999 Two-Pound coin. Special reverse design is created by medallist Ron Dutton and carries a hologram at its centre, the first to be used on a coin of the United Kingdom. Coin comes in presentation box with COA from the Royal Mint. Coin in superb untouched condition. 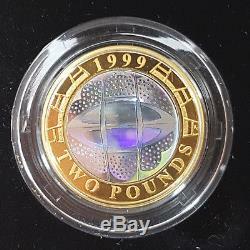 The item "1999 Piedfort Silver Proof Rugby World Cup 1999 Two-Pound coin" is in sale since Friday, April 27, 2018. This item is in the category "Coins\Coins\British\Proof Sets/Coins\2000s". The seller is "allgoldcoins_uk" and is located in Carshalton. This item can be shipped worldwide.